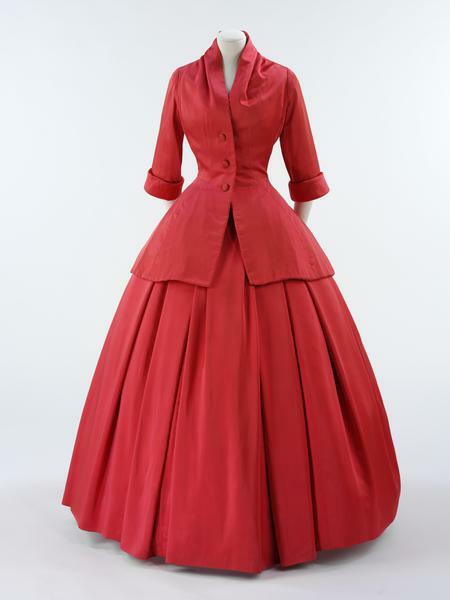 By the mid 1950s Christian Dior (1905-57) was producing around 12,000 dresses a year. His fashion house was the most successful and widely known of the post-war era, and his international sales constituted over half the Paris couture exports. The dress shown here is called Zemire and was part of Dior’s H-line collection of Autumn/winter 1954-5. It is one of his most historical designs, echoing the shape of riding-habits, and it was successful. The original model in grey silk satin was shown to Princess Margaret at Blenheim Palace in 1954, and it appears in several magazine features. A ready-to-wear version was licensed to Susan Small, a British company that made ‘line-for-line’ copies for Harrods. It sold for 22 guineas, a fraction of what a made-to-measure version would have cost. This ensemble was commissioned by Lady Sekers, wife of the British textile manufacturer, and made in an innovative man-made fabric produced by the Sekers company. An evening ensemble of red cellulose-acetate satin lined with red silk, comprised of under-dress, skirt, top, and jacket. The under-dress is made of a white tulle bodice with metal coil boning, strapless and fastening at the back with hooks and eyes. The skirt of the under-dress is of red tulle hemmed with nylon net, under-skirt layers of nylon net panels and red organza. 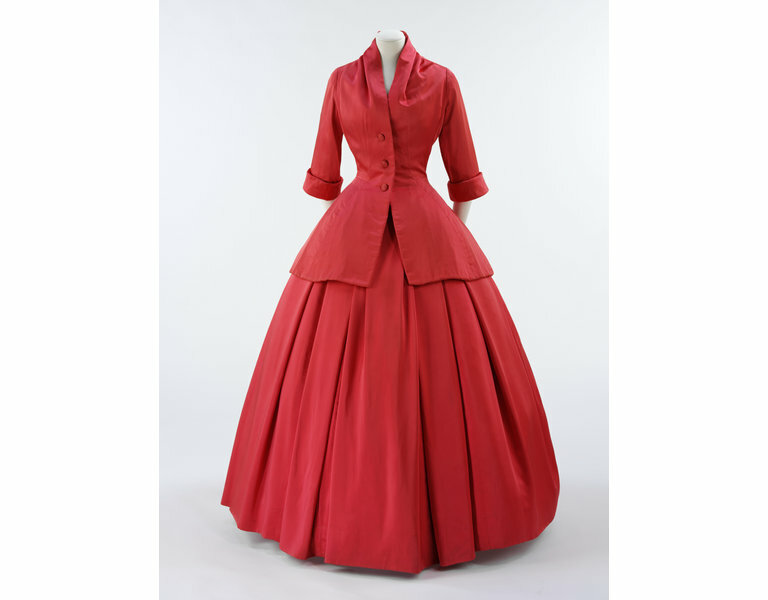 The very full, full-length skirt is of red satin which fastens at the back with hooks and eyes. The skirt has been altered around the waist. The bodice is of red satin. It has two shoulder straps which have been shortened. It fastens at the back with a zip (replacement). It had been taken in with tucks under each arm. It has a short peplum. There was a detachable metal brooch at the centre-top front, shaped like a Medici coat of arms. The brooch was removed as it was not original to the design and was damaging the textile. Inside the bodice at the top are labels. 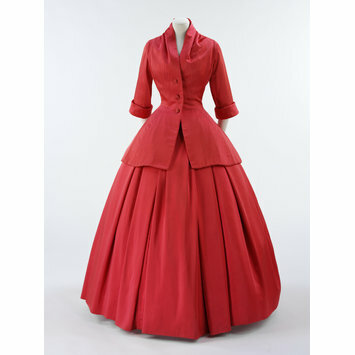 The jacket is also of red satin with ¾ length sleeves, fastening at the front with 3 self covered buttons. It has a high collar, a fitted waist and a wide long peplum. It is lined with red silk. Noted during the conservation process. Probably the original chalk marks of Dior's atelier. In 2006, the V&A acquired this ensemble (from the Cornette de Saint-Cyr auction house in Paris). The auctioneer claimed it had been found in a damp cellar by the Seine; no more information about provenance was available. A handwritten tape inside the bodice suggests that the dress was made for the wife of the leading British textile manufacture Miki Sekers of the West Cumberland Silk Mills. The story of the dress (including the Sekers link) was published in The Guardian (March 16 2007), and the museum was subsequently contacted by the descendants of Miki Sekers, who recall that Miki's wife, Lady Agotha Sekers, was often persuaded to commission clothes that would publicise the company’s innovative fabrics. They also recalled that Lady Sekers (or Agi as she liked to be called) would often abandon fittings as she preferred to go sight-seeing when in Paris. The family supplied a Sekers company brochure from 1951-2 featuring the same textile as used in the dress. Why the ensemble was abandoned is not known. It was clearly worn by others than Lady Agota as there were extensive alterations to the waist, shoulder-straps, and under-arms. The original 'Zemire' model was in silver-grey satin by Brossin de Méré with mink-trimmed cuffs It was one of the selection presented to Princess Margaret at Blenheim Palace in 1954. A postage stamp sized piece of the fabric survives on the couture house chart which also documents its maker (Christiane) and the model who wore it (Renée). Interestingly, ‘Zemire’ was not only an important design which received at least one private client commission, but was also successful in terms of commercial reproduction – it can be fleetingly glimpsed in some seconds of promotional film produced by Dior in 1954 (for Gaumont Pathe newsreels), and was featured in several magazine features. It is one of Dior’s most consciously historical designs. The ‘riding’ jacket and full skirt have a distinctly eighteenth-century flavour, and are made using archaic construction techniques. The Theatre Museum also holds a very similar design - a Dior design for Vivien Leigh (made by Angels & Bermans) for the 1956 London staging of 'Angels & Demons'. The H-line collection of autumn/winter 1954-5 was Dior's most controversial line. A Pathé newsreel of the time presents the choice as "H for heavenly, or H for horrid". It was considered an unsuccessful line by some, who disapproved of the flattened bust of the look. Like all of Dior's collections however, it was commercially successful, and deemed popular by most. International Herald Tribune, Tuesday September 18 2007. Christian Dior became an overnight sensation with his ‘New Look’, launched on 12 February 1947. He continued to create designs based on its distinctive hour-glass shape throughout his career. ‘Zemire’ was commissioned by Lady Sekers, wife of an innovative British textile manufacturer. The original version was made in grey satin but she chose one of the latest Sekers synthetics. The under-dress is made in traditional silk and net. By the mid 1950s Dior was producing around 12,000 dresses a year. His fashion house was the most successful and widely known of the post-war era, and his international sales constituted over half the Paris couture exports. Zemire was a successful design. The original model in grey silk satin was shown to Princess Margaret at Blenheim Castle in 1954, and it appears in a promotional film and several magazine features. A ready-to-wear version was licensed to Susan Small, a British company that made ‘line-for-line’ copies for Harrods. It sold for 22 guineas. This version of Zemire is a private order and would have been very expensive. It was commissioned by Lady Sekers, wife of the British textile manufacturer, and made in an innovative man-made fabric. The V&A only acquired the ensemble last year. It had been stored in a cellar by the Seine in Paris and had to be cleaned and repaired before it could be displayed. Dior often made cultural references when christening his designs. ‘Zemire’ was named after Zémire et Azor, an opera by Grétry first performed at the royal palace of Fontainebleau in 1771. Initially, it was called ‘Fontainebleau’, but this was crossed out on the chart and replaced by ‘Zemire’. This publicity brochure contains a sample of the Sekers fabric used for Zemire. ‘Duchess Dogana’ yarn-dyed satin was one of the company’s most popular products. It was available in a range of bright colours. Many important Paris couture designs were made in Sekers fabric, despite restrictions being placed on fabric imports by the French authorities in the early 1950s.